Share your favourite dog photos. A picture tells a thousand words. So what are you waiting for, send pictures of your dog in now and your pooch could become the next celebrity dog at Dogs Gossip! Check out these cute dog photos. We just love this photo. This odd couple, Max and George, the Mini Fox Terrier have been inseparable since George joined the family two months ago! Moe-Moe the Pug dressed in his St. Paddy's Day best! Bailey our Pug dressed as Santa. So cute! I have (8) Papillons and they are very photogenic. Just wanted to share. No this was NOT photoshopped and no they won't be this good for me! This is Tiffany our 3 1/2 year old, 4 1/2 pound Pomeranian. She likes to rock a mohawk and shades! Funny dog video: May you sing like no one is listening! Cassie with her new favourite toy! Sydney, a Newfie/Lab, is so sunny, she's gotta have shades! Best positions in bed - some new, some old! What Mess! How could this innocent little pooch be guilty? We just came out of the bathtub and mum put us in the washing basket! Kaya at 9 weeks old, Great Dane puppy. Photo courtesy of Charlotte Reeves Photography. Read about our interview with Charlotte. the photo, skilfully laser engraved for years of lasting memories. If you like this you might like to personalize a mug, towel, bandanna, tote bag also! Sad Domino, our 5 year old English Springer Spaniel couldn't get his Easter Egg open! RSPCA Bluewater Walk Fundraiser 2010. RSPCA Bluewater Walk Fundraiser 2010. Pug in Tuxedo dog costume. Zali celebrating her 1st Birthday. Zali, our Schnauzer, just knows it's a special day and just wants someone to blow out the candle before doing the honour of eating the cake! Tucker, my best friend, is a 12 year old Maltese Shitzu Cross. Justine, Cairns. Read Tucker's story here. See the picture above, that's me at 10 weeks. I am now 6 months old! Nelson, a mixed breed, loves nothing more than being on the beach. He is 18 months old and weighs 60 kgs! Arnie relaxing in his doggy bed! 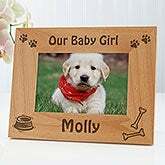 If you enjoyed this page you might also like to view dog breed photos or celebrity dog photos.